Zambia – a country in South Africa, which has no outlet to the sea and surrounded entirely territories of other southern African countries such as Zimbabwe, Tanzania, Angola, Mozambique. The capital – Lusaka; other major city – Kitwe, Ndola. The climate is tropical. In the western and southern borders of the country flows the river Zambezi, famous for its affluent and picturesque waterfall Victoria’s. Falls also has a border location. The total population, according to recent data, about 14.5 million people. Most of the Bemba ethnic group (over 20%). With the arrival of Europeans in the 18th century it formed the first state – Barotse, which today is the western province of the country. The largest contribution to the development of the southern African countries have the Portuguese and the British. In Zambia the state system – presidential republic. 10 provinces. Official language – English, although in use for more than 70 local dialects. Currency – Kwacha. More than 75% of the population are Christians. There are also Muslims, Hindus, Sikhs and Baha’is. Victoria Falls – one of the most powerful waterfalls in the world; Located on the Zambezi River on the border between the two southern African countries – Zambia and Zimbabwe. The name of the waterfall came up with an outstanding African explorer D. Livingstone. He decided to name it in honor of the British Queen Victoria. Locals call it differently – Mosi-oa-Tunya, that their dialect means “thundering smoke”. 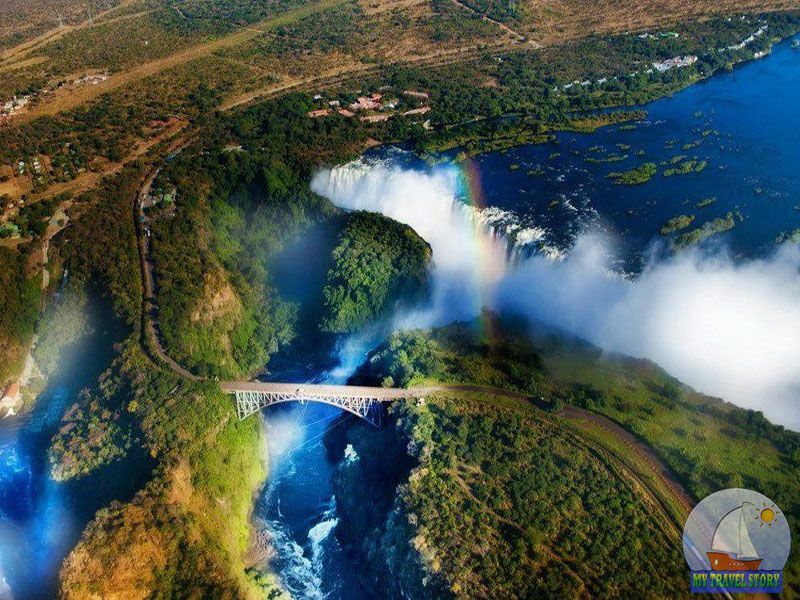 There is another common name – Chongue, which means “place of the rainbow.” Victoria Falls is famous, above all, its charming and picturesque views. All year round tourists flock to it from all over the world. This powerful stage has parameters such that no other waterfall in the world with him can not be compared on a combination of height (120 m) and width (1800 m). Even difficult to imagine that one waterfall stretches almost 2 km. 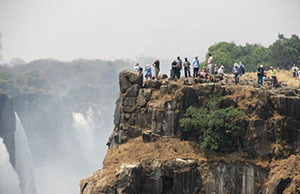 He easily covers an area of ​​two national parks – “Gremyaschi smoke” in Zambia and the “Victoria Falls” in Zimbabwe. An interesting feature of the Victoria Falls is the fact that the water of the river, and millions of liters of water, falling into a narrow gorge, runs a zigzag gorge and falls down with a crash, creating clouds of mist that can be seen for miles. In a word, its power is known far beyond the borders of Africa, but to the middle of the 19th century, no one except the indigenous people of Zambia and Zimbabwe had no idea about the existence of such beauty. The first Europeans to officially record this miracle of nature, the British were led by D. Livingstone. Although there are early descriptions of the waterfall and the Portuguese. In 1905 the first railroad was built in the region, and curious visitors increased flows. The most spectacular period begins in spring, when the Zambezi river is full-flowing so that every second down falls about 5 million liters of water. At such moments, couples, rising from the spray can be seen for 30 kilometers. By its nature, the Zambezi river is quite calm, but everything changes when it reaches the basalt plateau that separates it into multiple streams at once. Here is where it breaks down the powerful cascades. Opposite the waterfall is seen yet another plateau, entirely covered with jungle. Viewing platforms around the waterfall a few. One of the most successful is called a “cutter blade.” From here you can see main waterfall, stretching into the Gorge. From a platform at the railway bridge, you can literally look into the boiling void waterfall. But consider Victoria entirely possible to only a bird’s-eye, and it was during trips to paragliding and helicopters. To date, around the waterfall region has a developed infrastructure. If desired, visitors can stay at one of the hotels in Zambia or Zimbabwe. One day, perhaps, will not be enough to inspect all the surrounding attractions. First, attention should be national parks, adjacent to the waterfall. They are home to a huge number of African animals -. Rhinos, antelopes, elephants, giraffes, etc. Secondly, it is necessary to visit a museum dedicated to the history of the falls. Oh, and thirdly, ekstremaly may at any time engage in bungee jumping over Victoria noisy streams. It sounds scary, but certainly unforgettable sensations. Fans of kayaking and rafting is also might like. Who wishes to take a dip in the waters of Victoria, visit the “Font devil.” This is one of the most tranquil waters at the top of a basalt slab. Despite the fact that the lower part of it is separated as much as 120 meters, there are many swimmers, especially in the fall, when the water level decreases. 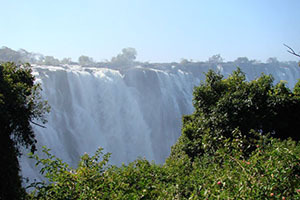 You can get there by plane or bus from Lusaka to Livingstone, where local transport will take half an hour to the waterfall. 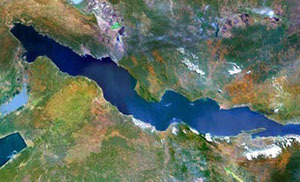 Tanganyika – Lake in East Africa. Located on the territory of the Democratic Republic of Congo, Burundi, Tanzania and Zambia. Lying at an altitude of 773 m above sea level, the area of ​​32 900 km2, maximum depth of 1470 m. The second-deepwater in the world after Lake Baikal. It feeds on a variety of rivers, the largest: the Ruzizi and Malagarasi follows one river – lukuga river, which falls in the Congo. 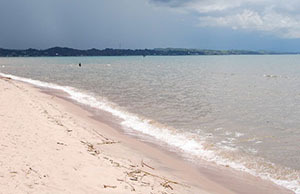 The lake is located the city: Kalemie (DR Congo), Bujumbura (Burundi), Kigoma, Ujiji (Tanzania), Mpulungu (Zambia). Tanginiki very ancient origins and a long period of isolation put the development of a large number of endemic organisms. A lot of them among the family of cichlids fish, shrimps, ostracods, decapods, copepods, gastropods. Also on the lake are found crocodiles, hippos. The lake is navigable. Major tributaries Kabompo, Lunge-Bungo, Luanginga, Kafue, Luangwa. Located cities Cazombo (Angola), Livingston (Zambezi), Kariba (Zimbabwe), Tete (Mozambique). On the river is the greatest in the world Victoria Falls. 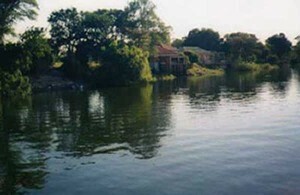 Zambezi – exotic river, there are found: fish – butterfly fish – tiger, crocodiles and others.